ShortStitch is a super cool kids clothes and accessories, shopping and delivery service. Aimed at busy parents and for children aged 3-10 years old, ShortStitch curates a selection of clothes, shoes and accessories from a wide variety of unusual brands from around the world and delivers them to you. You then keep what you want and return what you don't. This service saves a lot of time, they do all the sourcing, choosing and thinking for you plus you get shop from the comfort of your own home and at a time that is good for you. No more toddler tantrums on the shoe shop floor! To sign up you register on the website and answer a few simple questions about your child - selecting the clothes style that most suits them and what their requirements are. Then a few days later your Box of 'YAY' arrives. The first thing that i was impressed by was the amount of stuff that is in the box - jeans, jumpers, a coat, 2 pairs of shoes, shirts, socks, a hat and more. And it is all SO nice, such great quality and variety and from some really great brands - some of which i hadn't heard of before and would have otherwise not known to look at. I was also surprised at how fun it was - opening the Box of YAY was like Christmas! My son even enjoyed it and it was so much more pleasurable (and much quicker) than taking him around the shops or going myself. ShortStitch make the whole process seamless, the service is excellent - the box contains a personalised note containing outfit ideas, a price list, a returns label and a map of where your nearest drop off is. Alternatively you can call them and they will arrange for the box to be collected from your house. There is no obligation to buy and you have up to 10 days to choose. You can ask for your box to be tailored for a special event or for a season it is up to you. 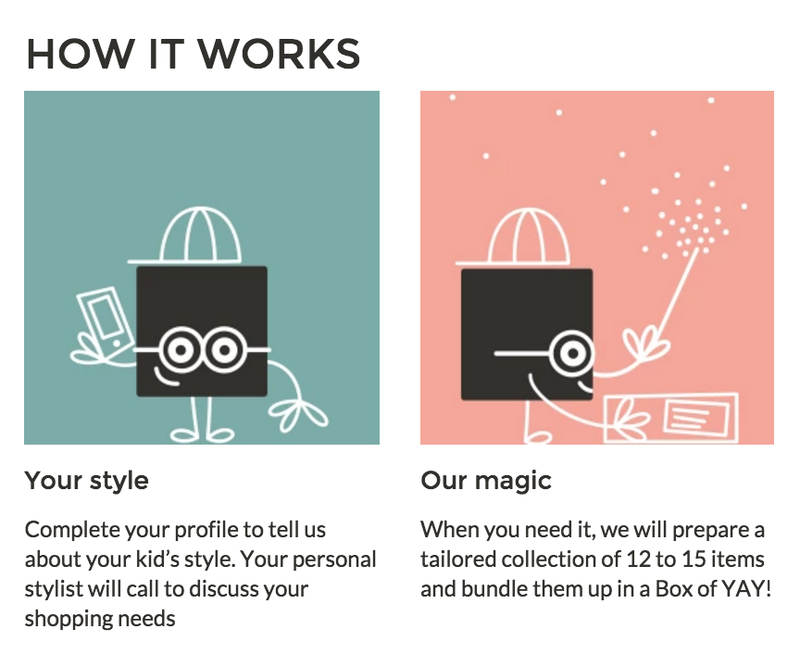 When your child needs new clothes you contact ShortStitch and the stylists has a record of what you bought and liked from your previous box and so can further customise your next one. I was very impressed by ShortStitch - it is a brilliant concept that really works, the service has been executed perfectly and the pain, time and logistics of kids clothes shopping has completely gone. We're looking forward to our next Box of YAY! BY WHOM IT WAS FOUNDED: Darina Wallace & Chris Haskett. We are a husband and wife team. WHY WAS IT CREATED: Chris & I wanted to start a family but I didn't want to give up my career as a buyer. With buying comes long hours and lots of travel. I knew those sort of working conditions are not ideal when you have children. ShortStitch allows me to work from home, work around my family's needs and work in an industry I love. It's a lot of work but it's all so worth it. ShortStitch was also founded as Chris and I saw a gap in the market. Nobody was offering parents easy access to designer kids clothing. Yes parents can shop online but it's time consuming and not always easy to find new brands. And let's face it, kids don’t always want to go shopping the high street or in Department stores. ShortStitch gives parents the best of both worlds by bringing the shopping experience into the home. WHAT WE NEED TO KNOW ABOUT YOUR BRAND: We are a fashionable, fun and convenient shopping & styling service. We support our parents through the shopping process by presenting them with ready to wear outfits, and introducing them to fresh products and brands. Our Boxes of YAY! create an element of surprise and excitement for both the parent & child. It's an obligation free shopping service and parents pay only for what they choose to keep. Styling, delivery and collection are on us. Make shopping for kids a cinch! WHAT WE SHOULD BUY FROM YOU: Choose individual pieces, or ready to wear outfits from your Box of YAY! We have a gorgeous range of designer kids clothes and footwear with items starting from £25. We are working with fantastic brands like Emile & Ida, idigdenim, Beanie & Bear, MAA and Angulus. We’ll keep expanding this offer so our parents are constantly up to date with what's hot.